I'm renovating my early 1990s Raleigh Royal touring bike and would welcome some advice on gearing. Currently it is 3 x 7 with a Shimano 12-28 7-speed cassette and a 24-36-46 Shimano SG chainset. I intend to upgrade it to 9 speed (11-34), as the gearing is no longer low enough, and bar-ends as opposed to the current downtube levers. The current system is indexed at the back but not the front and I am happy to keep it that way especially if I can avoid having to acquire a new front mechanism. It will also be getting a re-spray. 1. Will the existing chainset and rings be suitable for use with a 9-speed chain/system as I was hoping to avoid having to replace the chainset and front mech? 2. What should I get the rear drop-outs (currently 126mm) re-spaced to? 3. Any recommendations on which hub, derailleur and bar end levers to get (I was thinking Shimano XTM772 Shadow mech and Shimano Dura Ace 7700 bar end shifters)? 4. Have I missed anythingf? I have a 1987 Raleigh Randonneur, probably much the same frame as yours in 531st. Mine is also running 9 speed, with a 12-32 cassette on Ultegra hubs so 130mm spacing. The frame will spring naturally to accommodate 130 hubs without much effort at all so this is the easiest route. 135 would allow you to use mountain bike hubs with their hopefully better sealing, and these will build into a stronger wheel with less dish. This is probably worth doing if you're intending to use the bike as a proper loaded tourer. Your choice! Big wheels good, small wheels better. Chainset/F. mech will almost certainly be OK.
10 speed "Mountain" R. mechs. wont index with 9 speed road levers, but 9 speed mountain R. mechs will. 1. the FD will be fine, and if somewhat used (rather than brand new) the chainset will probably be OK with a 9s chain. If there is a problem, it'll be a reluctance to downshift onto the small ring from the middle. 3. 7700 bar end levers and RD-M772 will work OK, but you will need to add a barrel adjuster somewhere in the cable run, eg on the 'ergo boss' that you will fit onto the DT bosses. 4. you could save a few quid by throwing the 11s sprocket from an 11-34 cassette into the bin, and fitting the remaining 8 sprockets to a 7s freehub. You will have a 3x8 system with 9s spacing and with the low gears that you want. There are many possible combinations using a custom cassette BTW; with 9s probably you would be better off with another sprocket in the middle somewhere rather than an 11T sprocket fitted. Brucey wrote: 4. you could save a few quid by throwing the 11s sprocket from an 11-34 cassette into the bin, and fitting the remaining 8 sprockets to a 7s freehub. You will have a 3x8 system with 9s spacing and with the low gears that you want. Brucey, if I do what you suggest at 4 do I avoid having to respace the dropouts? AMMoffat wrote: Thanks for the suggestions so far. pretty much, yes. 7s hubs are 126mm spaced (road) or 130mm or 135mm spaced (MTB). Obviously the latter builds into a stronger wheel. You can always respace the dropouts at some later date if you deem it necessary. 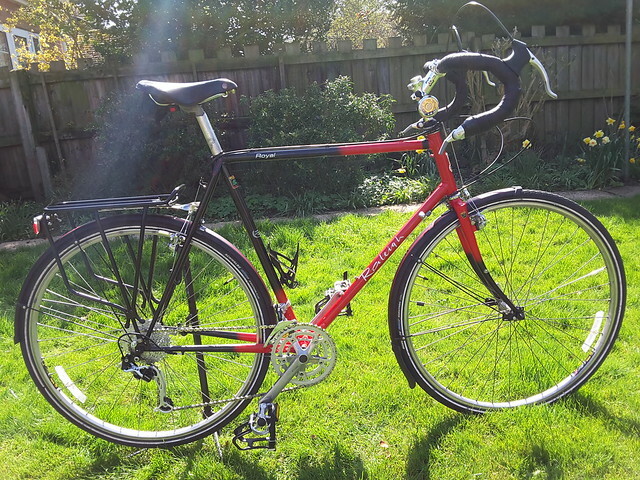 Thank you to all who provided advice on the renovation of my 1992 Raleigh Royal. I eventually went for having the rear dropouts respaced to 135mm. So, re-built rear wheel using the original rim and new hub, new 9 speed derailleur and 11-34 cassette and conversion from down-tube to bar end levers. The original front derailleur and 46-36-24 chainset work fine with this set-up. I indulged myself with new mudguards (with red sripes) to match the paint job (not strictly necessary). Paint job and rear drop-out re-spacing done by Dave Yates who has done a fantastic job. Is that a quill to A-head stem adapter? Are you close to Dave Yates? I'm from south Lincolnshire originally - have to admit that I hate cycling on the flat fens. It is indeed such an adapter, added a few years ago so I could get the bars higher and reduce the reach. I'm in Peterborough so close enough to Dave Yates to take the bike to him. This is the 2nd frame he's re-sprayed for me. Fortunately you can go west from Peterborough to avoid the fens which I also dislike. Must be something to do with spending my 1st 23 years in Aberdeen.